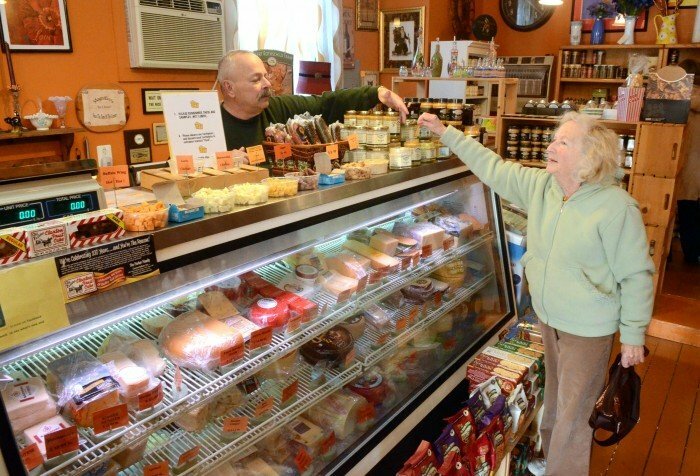 Magnifico’s Say Cheese is a small, independently owned specialty food store specializing in hand-cut cheese. This tasteful store is for the sophisticated snacker and cheese lover alike. Magnifico’s, an old-fashioned cheese shop, that has the finest gourmet and artisan cheese and of course they hand-cut to order ensuring every customer is confident in their purchase. Magnifico’s Say Cheese is wonderful gourmet cheese shop that also carry dressings, sauces, dips, and snacks, a little something for the gourmet eater in everyone. Magnifico has the largest hot sauce selections in South Jersey, enough to fill a whole wall! Merely the name of some of the sauces is enough to strike fear into the bravest of eaters. A wonderful assortment of serving trays, and novelty food items are a plenty. If you need something to eat, to serve on, to cut with or to spice it up, you will find it in Magnifico Say Cheese. Stop in while visiting Historic Smithville, Magnifico’s is located in the old school house on the Greene, # 64 on the Walking Map. This entry was posted in Shoppes I - Q, Smithville Stores and tagged cheese, Historic Smithville, Historic Smithville NJ, Magnifico's say cheese. Bookmark the permalink.